If only one or two of your teeth are missing, your dentist may recommend a bridge. This consists of two crowns, which are placed on your natural teeth either side of the space, with a false tooth in the middle. Bridges are made of porcelain and/or metal and there are many designs. 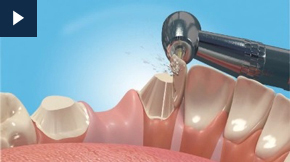 Your dentist will prepare your natural teeth on either side of the space for the crowns to fit on top. These crowns are permanently attached to a false tooth in the centre. Your dentist will cement the bridge in place, so you can't remove it for cleaning. To keep your natural teeth healthy, clean the gap under the bridge with a special dental floss. Ask your dentist or hygienist to show you how to floss under your bridge. Another type of bridge called an adhesive bridge has wings that your dentist bonds to the back of your supporting teeth. Ask your dentist which type is the best option for you. Bridges can last anything from seven to 15 years.